Britain has been a major military nation for thousands of years and its history is littered with the names of famous battles. Yet one name appears to stand out from all the rest and has come to be used in the English language to epitomize bravery in the face of destructive forces beyond control. The Battle of the Somme in 1916 is known by everyone and accepted by military historians as both a costly campaign fought under extreme difficulties as well as a necessary one to try to drive the enemy from his fortified defensive positions. Much else has been written about the Battle of the Somme, including by those who saw the generals as idiots and the soldiers as the brave being put to the slaughter – “Lions led by Donkeys.” However, as time has elapsed, a more sympathetic approach has been adopted towards Haig and his generals on the Somme. In this assessment Peter Hart has come to accept what Sir Douglas Haig himself had written in June 1916 before the commencement of the battle. The British efforts in 1914 and 1915 had stemmed the German’s initial advance and led to the stalemate of the trenches and the various attempts to break through. None of these had succeeded and showed up both a lack of tactical awareness on the part of the high command and a lack of military hardware, especially artillery. The failure at the battle of Loos in 1915 prompted the politicians to sack Sir John French and replace him with the man who would be the head of the BEF for the remainder of the war -Sir Douglas Haig. The war effort was being severely compromised by the fact that there were two opposing views as to how the war could be one. For Haig and his fellow generals it could be won only on the Western Front, by achieving supremacy over the German Army. For others, like Winston Churchill and David Lloyd George, the war could be won by using Britain’s naval strength and attacking the enemy in the East - hence the various campaigns in Gallipoli, Mesopotamia, Salonika and even Italy. The retreat from Gallipoli did nothing to diminish their views, as a consequence of which, many valuable divisions of troops were tied down in these secondary theatres. The other complication was that the French were still the dominant force in the Alliance and their commander, General Joffre, made the strategic decisions on the Western Front. The French had born the brunt of the casualties and some in the hierarchy of the British military even thought that the French might cave in unless the British did something in 1916. Indeed, Joffre too thought that it was time the BEF, that had been bolstered by the arrival of the first K1’s in early 1916, should begin to pull its weight. On 6th December 1915, the Chantilly conference had decided that there would be coordinated offensives against the central powers by both the Anglo French and Russian forces. Joffre wanted a joint British /French attack north and south of the river Somme. This had been a very quiet sector of the front and as such had given the German defenders the chance to build extremely deep and dense fortifications, like no others anywhere on the front. Haig had tried to reduce the BEF involvement in this planned attack as much as he could, especially as he favoured the Ypres sector for any BEF offensives. However, in February 1916, the Germans launched their attack on Verdun - to “ bleed the French Army white” and thereby knock them out of the war. It changed things forever, as the BEF was forced to take on the responsibility for a bigger section of the front and therefore a bigger involvement in the battle of the Somme. The die was caste. It was 1st July 1916. Kitchener’s New Army of the Pals Battalions would be thrown against the German Fortress created in the rolling hills of the Somme valley. These volunteers from the shires and industrial cities of Britain went through a brief training programme at home that bore no resemblance to the trench warfare in which they were about to be engaged. To give them some idea of what to expect, every new battalion transferred to France was put with a regular battalion who supposedly showed them the ropes. But in comparison with the German Army, the degree of preparation was sorely lacking. By 1916, the high command had come to accept that the key to success in this newly mechanized warfare was the artillery. There had to be a bigger and bigger concentration of fire power and there had to be different ways of delivering it, hence the development of big guns, machine guns and trench mortars. Behind the lines the men trained for the big day by recreating the German trench system that they would be attacking. 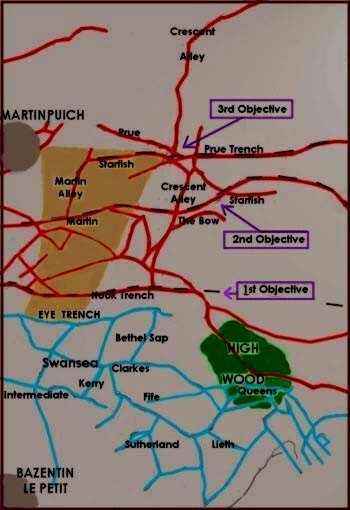 So the plan of attack unfolded in the minds of the generals, but there were substantial differences of opinion between Haig - who wanted to break through the German lines at various points so that the cavalry could be let loose, and Rawlinson - who was much more cautious, preferring limited ‘bite and hold’ objectives. Haig won the argument and the final plan was designed to push past the 1st and 2nd German trench systems before breaking out into the open country. The artillery was indeed beefed up, so that along the 20 mile front of the attack there would be one field gun per 20 yards and one heavy gun every 58 yards. Ammunition was plentifully available and located in dumps close to every gun. The plan revolved around a massive barrage over days, which would destroy the German wire and fortifications so that the infantry at zero hour could walk across no man’s land and capture the first line of the German trenches unimpeded before moving on, with the aid of the supporting battalions in the second wave. The myth of the non existent German wire and the ability of the infantry to walk, heavily laden, across no man’s land, was created at a very early stage and lasted right up to the end of the first wave attacks. However, many of the Germans were physically untouched by this bombardment as they sheltered in their deep dugouts under the chalk. On 30th June the huge mass of the attacking battalions moved into their communication trenches ready to go at zero hour, 7.30 am on 1st July. What happened on that day has been well documented and the subject of many films and documentaries. All along the front at the sound of the officers’ whistles, the Pals battalions from the cities and shires of Britain climbed up the steps and went over the top - some to certain death and a few to everlasting glory. Loaded down by packs containing equipment, rations, and ammunition enough for days as they were to be marching through the supposedly crushed German lines to the open countryside. They were told to walk in line abreast, though in many instances they met with a hail of machine gun bullets as they had to cover thousands of yards of No Man’s Land. The staggering and incredible figure of 57470 casualties in one day becomes more credible by a visit to the many cemeteries of the Somme region and to the towering Thiepval Memorial to the Missing. The Battle lasted from July through to November 1916 and involved some 56 Divisions of the British army about 700000 infantry, plus others in a supporting role. The 616 infantry battalions involved in the Battle from 1st July to 18th November 1916 are well documented in Ray Westlake’s book ‘Tracing British Battalions on the Somme’. The total British casualties during the whole battle were 419654, of which 131000 were killed, 65000 having no known graves - their names now etched on the 48 panels of the Thiepval Memorial. 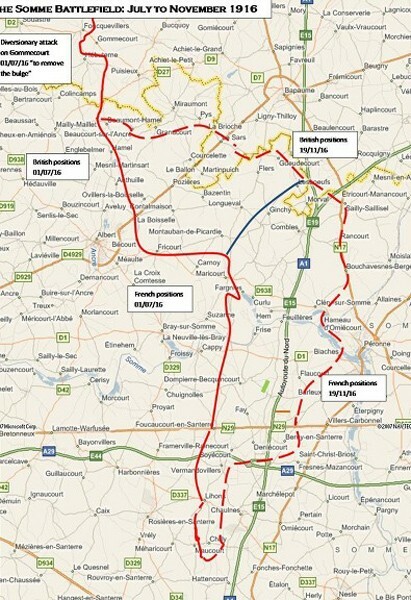 Territorial gains were made during this long period of attrition although Bapaume, a town - expected to have been taken on day one - had not been reached by 18th November 1916. Amongst the thousands of New Army troops involved in the Battle of the Somme were seven of my relatives, some of whom were in Territorial battalions, whilst others had been conscripted into Kitchener’s New Army. This is their story and amazingly all of them survived the Somme. Hot breakfast was served to the men at 6 am in CARNOY. 11am 8th Suffolks now in 55th Bde assembly trenches. 5pm Carrying parties started to carry forward water to Battalions of the 55th Brigade. So, Ernest Jarvis and the other new boys of the 8th Battalion had a relatively easy introduction to the Battle of the Somme and after stints in the front line around Montauban, they were relieved on July 8th and rested in a camp west of Bray. The 18th Division had suffered 3115 casualties in the Battle for Montauban. The next relatives to take part in the battle were the friends - Albert Jarvis and Wilfred Livermore from Felsted, who had joined up on the same day, 31st August 1914 at Chelmsford. Initially, they were both in the 9th Battalion Essex Regiment, but by 1916 Wilfred had been transferred to the 35th Battalion MGC which, like the 9th Essex, was in the 12th Eastern Division. Lillers. June 16th. Train no 12 with Bn complete left the station going via St Pol-Dollens-Amiens to Longueau where it arrived at 5 45 am on 1th . It was timed to arrive about 2 am but owing to heavy battery train and French troop train being unexpectedly parked in the siding in front of us we had to wait outside the station for over 3 hours. Longueau. 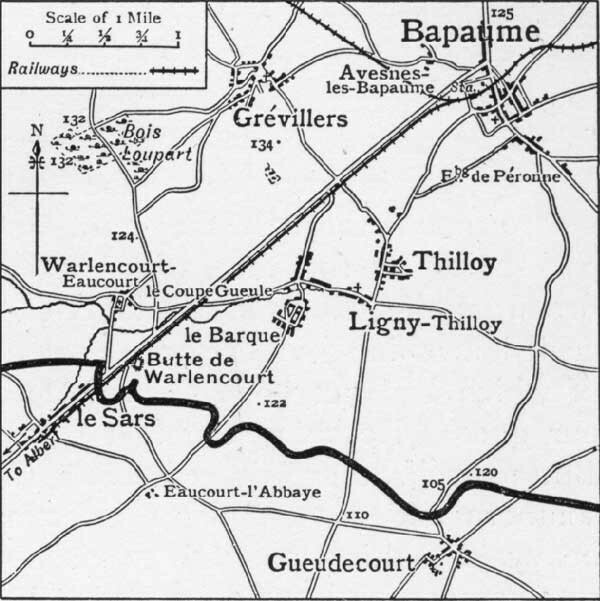 17th the Bn marched from the station to billets in Vignacourt via Amiens -- Flesselles. The march was a trying one after the long time in the train being 14 ½ miles . On arrival in the area the 12th Division joined 3rd Corps in the 4th Army and is held in GHQ reserves. Strength of the Bn on arrival was 27 officers 918 ORs 37 horses 24 mules 19 vehicles 10 bicycles. On 1st July, the opening day of the battle of the Somme, the 9th Essex and the rest of the 35th Infantry Brigade were in Divisional reserve in Henincourt. 6 30 pm the Bn moved forward into the village of HENINCOURT where a long halt occurred owing to blocking of the road to Albert by the other brigades of the 12th Division which were also moving up to relieve the 8th Division which had been severely mauled during the attack in the morning and failed to take OVILLERS. 8 45 pm The company halted in HENENCOURT having been cut off from the rest of the Bde column by cross traffic and was unable to move on again until the whole of the 35th Infantry Bde had passed by. 10 45 pm The Coy joined up with the tail of the 7th Norfolk Regt and continued to march to the trenches. 2.7.16 Arrived at CRUCIFIX CORNER where the men who were exhausted after the march fell out and slept as no guides could be found. The battalions of the 12th Division waited in the trenches for the order to attack, knowing that the 8th Division had made no progress on 1st July and no doubt seeing for themselves the carnage inflicted on their comrades by the German artillery and machine guns. How different could it possibly be for them when the time came? 2 15 am a heavy bombardment of OVILLERS by our artillery was carried out during the afternoon and night preceding the attack. The enemy’s retaliation became heavy about 3 am especially on front and supporting lines. 3 7 am the leading waves of the Berks and Suffolks left our lines. 3 20 am the 1st lines of the Bn followed in pursuit . The Berks and Suffolks went right over the enemy’s front and support lines and some troops entered the village together with the leading lines of the Bn which had come up in support. The Bn suffered severely during the advance across the open from MG fire from either flank and from the village. The troops were unable to hold their ground and were driven out by bombing and MG suffering very heavily in getting back. The attack on OVILLERS came to a stand still about 4 30 pm and the remainder of the 3 Bns withdrew inside our lines. 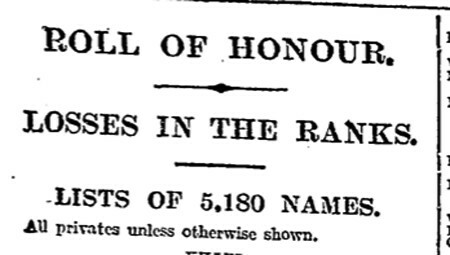 Casualties were 12 officers 386 ORs wounded missing or killed. In fact very few men from the 5 battalions who attacked Ovillers on 3rd July returned unscathed to their jumping off point. Many lay out in no man’s land, waiting to be saved - with many dying from wounds which could have been easily treatable had they been able to get back to their own lines. The medical services were swamped in the early days of the Somme by the sheer volume of casualties, for which they were not prepared. 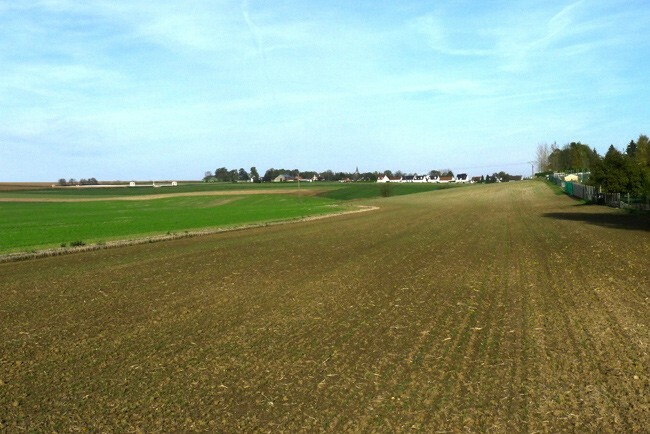 The 35th MGC supported this infantry attack and even continued to fire thousands of rounds upon Ovillers after the attack was called off, targeting the enemy who were walking around the village. 6.7.16 12 noon A party of Germans was seen by the guns walking in OVILLERS south of the church They were fired on by 1 gun & were seen to fall & disappeared. They were not seen again. Then on the 6th July at 4pm the 35th MGC was relieved by the 36th MGC at the same time as the 36th Infantry Brigade relieved the 35th Infantry Brigade, which went into billets in Albert. 7.7.16 Guns & equipment thoroughly cleaned and the men rested in billets ready to move at half an hour’s notice. All ranks were in the best of spirits and a piano having been found a concert was organized from 6pm to 8pm. 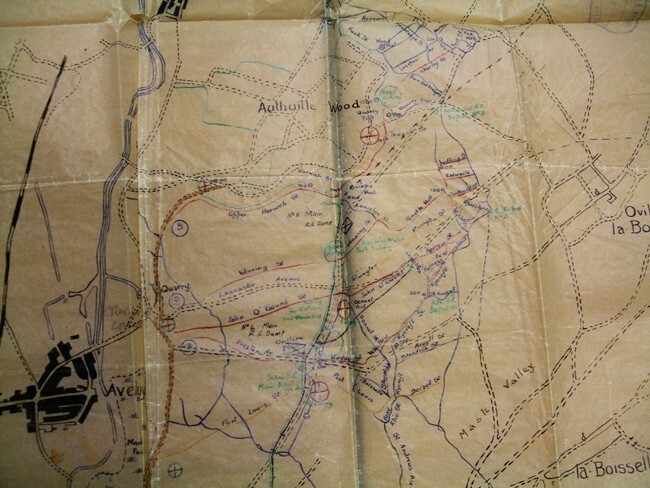 Wilfred Livermore and the 35th MGC continued to operate on the Somme, including a spell around La Boisselle in support of infantry attacks by 36th Brigade and the Anzacs until the end of August when they were moved to the Arras sector. 7.8.16 12.15pm Relief complete and Coy HQ was established in an old German dug out on the ALBERT—BAPAUME RD close to LA BOISSELLE. 8.8.16 9 20 pm An attack was made by the 7th Suffolk Regt in conjunction with 4th ANZAC Bde. and 8 ammo boxes were destroyed by shell fire. 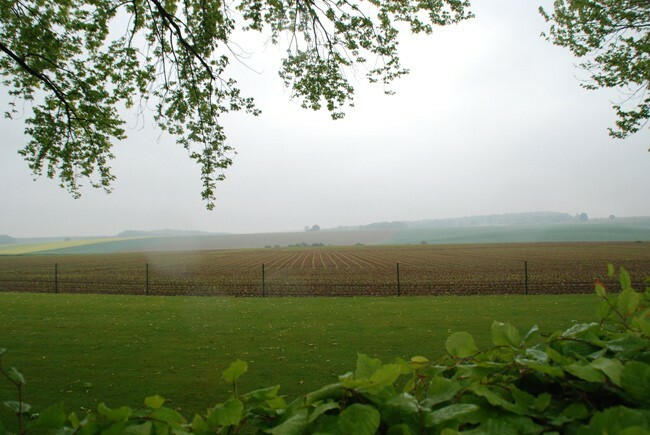 17.8.16 6.0 pm The company marched via BERNEVILLE –WARLUS and DAINEVILLE to ARRAS. 21.8.16 8.0 am Nine guns proceeded to relieve 9 guns of 33rd MGC in the trenches. Wilfred Livermore, unlike his friend Albert Jarvis, was indeed fortunate to survive the Battle of the Somme unscathed. The official figures show that the 12th Division had 11000 casualties during the Somme campaign. 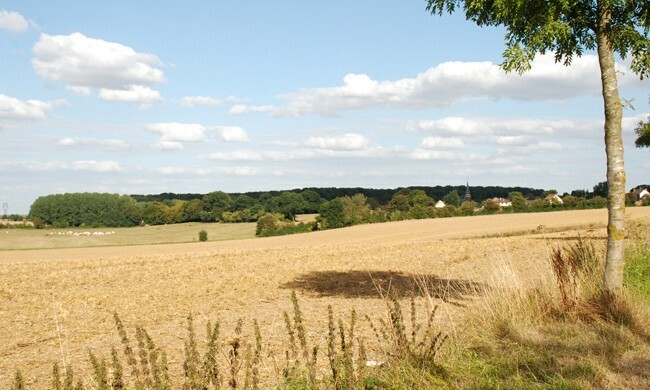 The Regimental History describes the nature of the 8th Suffolks’ intensive fighting around Longueval village and Delville Wood, both of which were defended to the death by the Germans. “At midnight on July 18-19 the 53rd Brigade was unexpectedly launched at very short notice and without reconnaissance in a most unenviable counter-attack designed with the object of clearing the village and the wood. The two miles of open country which stretched between it and the objectives had to be traversed in broad daylight with every available German gun trained on the assaulting troops. This was the battalion’s ( 8thSuffolks ) first experience of open warfare. Though this counter attack was unsuccessful the line in the village was advanced about three hundred yards. 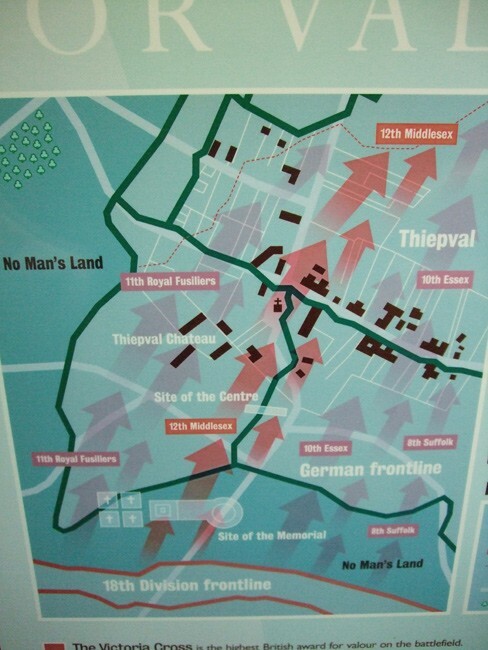 A company of 8th Suffolks did manage to relieve a detachment of South Africans on the edge of Delville Wood but by 4 30 pm on July 19th owing to severe losses from both shell and machine gun fire the attack failed in its entirety and the men were not in a position to make a further assault. It (The Battle of the Somme) was fundamentally a battle of the artillery. The British could not advance without it; the Germans could not defend without it. The roar of the guns was unceasing. It could grind away and erode the courage of all but the bravest. 20th About 2 55 am bombardment commenced preparatory to an attack on HIGH WOOD by 15th Corps. Our fire concentrated on HIGH WOOD First lift at 3 25am Second at 3 35 am on to final barrage line. Final barrage was established and continued for one hour. 24th at about 9pm the enemy counter attack at LONGUEVAL and DELVILLE WOOD 162nd Brigade Batteries switched over to that zone when a SOS was received and gave a quick barrage. This bombardment of the area around the village of Longueval and Delville Wood by the 162nd batteries, continued on and off until the end of July 1916. 30th Zero hour 6 10 pm bombardment to commence at 4 45 pm Ammn allotment 18 pdrs – 100 rds per gun – 4.5 hows 100 rds per gun increased from 100 to 200 rds per gun at 4 pm in case of 18 pdrs. This brief reference gives a taste of the daily lives of the artillery from their positions behind the attack zones - giving support to the infantry both in the attacks and in the defence against enemy counter attacks. By August 1916 the 162nd Brigade RFA had positioned its guns near to Montauban, ready again to support various attacks by the 33rd Division and others which took place from 16th August 1916. 23rd Orders received at about 7 pm for a renewal of the attack on 24th instant. This to be the biggest “push” since the 13th and 14th July. 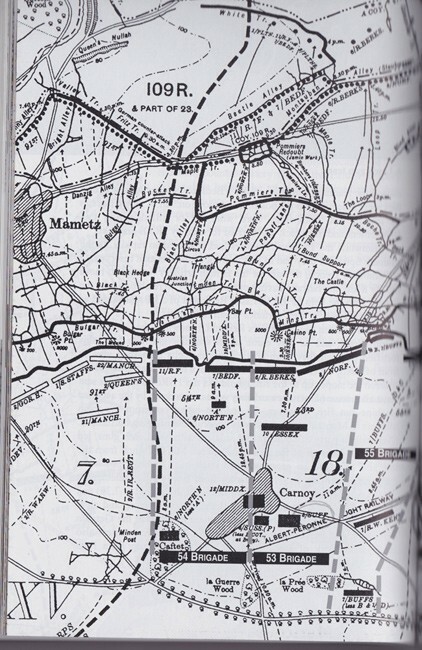 French attacking simultaneously with FOURTH ARMY from the SOMME to MAUREPAS. Task of 162nd Brigade to support the left battalion QUEENS of right brigade. Bombardment to begin at 3 45 pm. 24th orders as above carried out with most satisfactory results. 25th General Sandys GOC RA sent special congratulations to 162nd Brigade RFA for the splendid support given the infantry. There was however one very disappointing feature of the operations viz; the appalling number of duds amongst the shells of our heavy artillery – in all there must have been 60 % which either did not detonate at all or gave only small explosions instead of a real detonation. This was an outright criticism by a Brigade Commander that highlighted a well- documented problem experienced by all BEF artillery units during the battle of the Somme. The section of this war diary went on to compare the British experience with that of the Heavy German artillery where ‘duds’ amounted to a mere 5 %. Thus, they were able to inflict much greater damage on the British lines than we were able to do to them - perhaps a major reason for the lack of movement during the Somme offensives. September 2nd XV Corps attacked Village of GINCHY and trenches around it. The task of the 162nd Brigade RFA was to support left battalion of the 72nd Infantry Brigade. Special instructions were issued by commander –in- chief stating that these operations were of the utmost importance and desiring it to be impressed on all officers to satisfy themselves thoroughly that all under their command fully understood what was required of them. Regrettably, as in so many cases, the action did not go well and the writer of this war diary was again highly critical of his own side’s actions. From his position behind the lines with his artillery battery, he was able to see all that happened. September 3rd Thus on this front the whole attack was rendered utterly fruitless by the troops apparently being ignorant of the nature and locality of their objectives and consequently finding little resistance overran the points to be taken and were cut up in retiring. The final result was that our line at 7pm between HIGH and DELVILLE WOODS was the same as before the attack and the sacrifice had been appalling. The attack itself in its initial stages was as fine as there has ever been and had the promises of a great victory. On the rest of the front great success was met. GINCHY was taken lost and retaken on the following day . GUILLEMONT was taken and the French were successful along the whole of the front. So, Gunner Percy Livermore and his comrades of 162nd Brigade had played their part in the Somme offensive. On 6th September they were relieved by the New Zealand brigade and went to Bonnay, east of Amiens. They took no further part in the major battles and at the end of September 1916 they were in Dainville, west of Arras. Percy Livermore and the 162nd Brigade RFA were to play an important role in the opening of the Battle of Arras in April 1917. The opening phases of the Battle of the Somme had decimated many of the New Army battalions – the Pals’ Brigades - so that by late August significant reserves had to be sent to the Somme sector. These came from the training depots in the UK via the Channel ports and the Etaples Bull Ring training camps. Contrary to Haig’s wishes, he was also forced to move units from the Ypres sector that he considered to be more important than the Somme to maintain the momentum which Joffre the French commander insisted upon. There was no way out for Haig. The BEF had to continue to play the major role on the Somme where it became a matter of wearing down the German machine and the will and energy of its men. Much has been written by Haig’s critics about his reluctance to use modern technology - favouring instead the old techniques of open warfare and reliance upon the cavalry. There is plenty of evidence to show that this was wrong. He used gas in 1915, he demanded more of the new Vickers machine guns in 1915, he increased the number of Lewis guns per company, he increased the use of the Stokes mortars in the Somme and he used the Tank in September 1916 at the Battle of Flers - Courcelette. In fact, in the latter case, some critics including Winston Churchill thought that he had used the tank before it had been fully developed and before its proper tactical use with the infantry had been thought out. Just about 50 or 60 yards to the right of where we were we saw this tank come forward . Our infantry the 5th Yorks were alongside and behind him. 19th Battn. relieved at 6.0am by 69th Inf. Bde. 23rd Division and proceeded to Divisional Reserve. Whilst they were not specially mentioned here, the 50th Division had contributed its full share to this success. The use of the tank made a positive contribution to the battle, but there were not enough of them coming out of the factories, the crews had had insufficient training and the commanders had yet to work out new infantry tactics to use with the tanks. On 25th September, the attack was renewed - to take those German defences that had withstood the September 15th attack. Frank and Samuel Maltby of the 5th Yorks were back in the Star Fish trench system and on 26th September attacked towards Flers in the dark. Miraculously, although they got lost in the darkness, they were able to achieve their objectives - though again suffering heavy casualties. 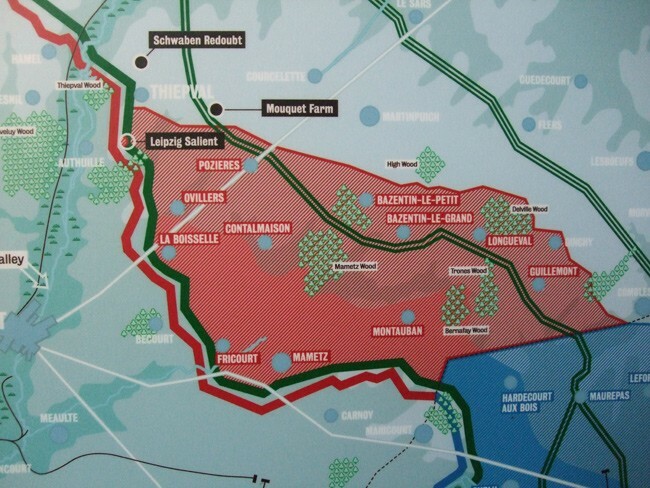 28th September saw the end of the Battle of Morval - a successful operation mainly because it had limited ‘bite and hold’ objectives, allowing a more concentrated artillery attack and the use of the tanks in a supporting role that helped to knock out points of resistance in the enemy’s defences. 29th Battn relieved at 11 am by the 6th Northumberland Fusiliers and proceeded into Divisional Reserve in Marmetz Wood. The War Diary shows that for the remainder of the Somme Battle, the 5th Battalion Yorkshires were in and out of the front line, but never engaged in any major battles. Frank and Samuel Maltby had survived the Somme like many others, because in the bloody, muddy, latter stages, their unit remained in Divisional Reserve. 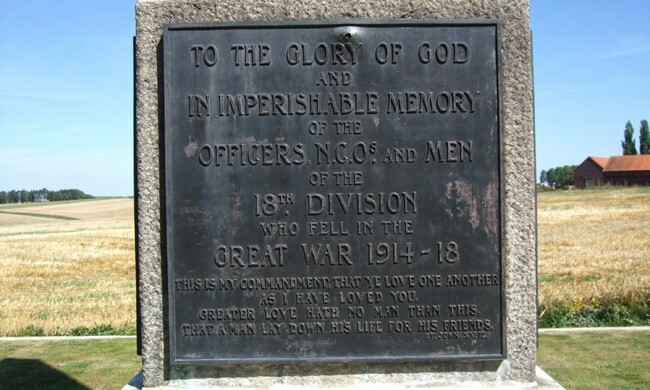 They were especially lucky not to be engaged in its last throws in November 1916, when the men of the Durham Light Infantry were sacrificed in a meaningless attempt to gain some high ground at the Butte de Warlencourt, before the extremely wet winter brought the Somme offensive to a muddy conclusion. Anyone who has visited the Thiepval Memorial to the Missing on the Somme can see for themselves how it dominates the valleys of the river Somme and its tributaries. It was the site of the most fortified German stronghold and beneath the surface still lie the remains of these fortifications and dugouts, which had withstood the valiant attempts of the 32nd and 36th Divisions on July 1st 1916. Haig was convinced that by late September 1916, the reserves of the German Army were failing and that it was the time to have another go at the Thiepval Spur. He planned an attack on a front of 6000 yards using the 18th and 11th BEF Divisions supported by the Canadian Corps. The artillery support would be huge using 230 heavy guns and 570 field guns with a constant barrage of flying bullets supplied by Vickers machine guns. The 18th Division included in the ranks of the 53rd Brigade the 8th Suffolks - Private Ernest Jarvis - the reluctant soldier. General Ivor Maxse the Divisional commander of the 18th Division was a perfectionist and a great supporter of proper training. ‘Without proper preparation the bravest troops fail and their heroism is wasted’ Ivor Maxse C. O. 18th Division. 23rd September On the afternoon of Sept 23rd Practice trenches had been made out in the vicinity of Varennes and every officer N C O and man in the battalion was shown the various landmarks and trenches where the halts would occur and all the details of the barrage. After this one practice attack of the country was carried out. 53rd Inf Bde will relieve 147thInf Bde in the line tomorrow. Fighting order with great coat carried on banderols over left shoulder. All men will carry the two sandbags issued. Gas helmets will be worn in the alert position. INTENTION the 53rd Bde in conjunction with the 54th Bde on the left and the 11th Division on the right will attack and drive the enemy off the THIEPVAL SPUR. The preliminary artillery barrage consisted of 60000 rounds of field artillery shells, 45000 rounds of heavier shells and 500 gas shells launched by the specialist RE unit. The zero hour on 26th September was set for 12 35 pm to allow enough daylight to achieve success before darkness fell. The 18th Division’s operation turned out to be a triumph of courage, organization and determination, in the face of stout resistance by the 180th Regiment of Wurttenburgers who had held their position for 2 years and considered themselves to be invincible. Thiepval village fell as the 53rd Brigade took their objectives with Ernest Jarvis and the Suffolk boys sticking to within 30 yards of their creeping barrage and taking Schwaben and Zollern trenches. The 53rd brigade deployed on a front of 500 yards. The Suffolks and the Queens from 55th Brigade were to be the assaulting battalions. Leading waves came under heavy rifle and machine gun fire from the southern fringe of Schwaben Redoubt. As it began to grow dusk after 5 pm the situation on the 53rd Brigade front appears to have been that on the right the Suffolks had made good their final objective and were established and in touch with 11th division. Schwaben that day was indeed a ‘soldier’s ‘battle. All night long bomb fighting went on without respite in the outpost line. All ( counter ) attacks failed and the line held while reliefs were carried out but about 7 30 am on 29th September the enemy flung forward a powerful counter – attack and wrested points from our hold. The Suffolks were relieved by the Berkshires. Thirteen battalions were thus entered in the fighting up to 5th October, the twelve battalions of the ( 18th ) Division and the 5th West Yorkshires. Until 5th October it is practically impossible to describe what took place in the disputed area. Heavy bombing attacks were delivered, fierce hand to hand fighting and the Germans made use of both gas and flammenwerfer. The trenches knee-deep in slimy mud were thick with British and German dead. By 5th October we had captured the whole of Schwaben Redoubt and on that day the 18th division was relieved by the 39th Division . The capture of the Schwaben Redoubt had cost the Division 1990 casualties in the eight days of fighting. FORCEVILLE 1ST Oct 1916 church parade in the morning --- after the service the Brigadier addressed and congratulated the Battalion on the Battle of Thiepval. Ernest Jarvis had seen and survived some of the worst fighting in the whole of WW1. The close fought hand to hand fighting of September 1916 was akin to a medieval battle, with the addition of the mechanized weapons of the artillery, machine guns, bombs, gas and flame throwers. The 8th Suffolks were in and out of the front line trenches during October 1916 and on 16th were to have attacked the Regina Trench but this was called off. When it was attacked on 21st October by the 18th Division, the Suffolks were in reserve and therefore not involved in the fighting. Their part in the Battle of the Somme was over. 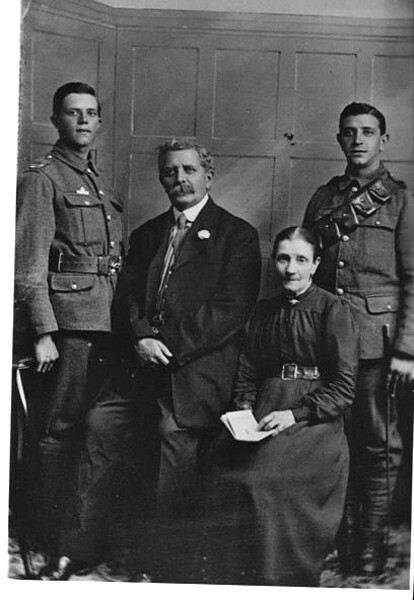 In late November Ernest Jarvis Pte 50473 went home on leave to marry Edith May Halls in Chelmsford. I know this because my grandmother, Ernest’s sister, went to the wedding at which Ernest told his family of the horrors of his experiences in France. 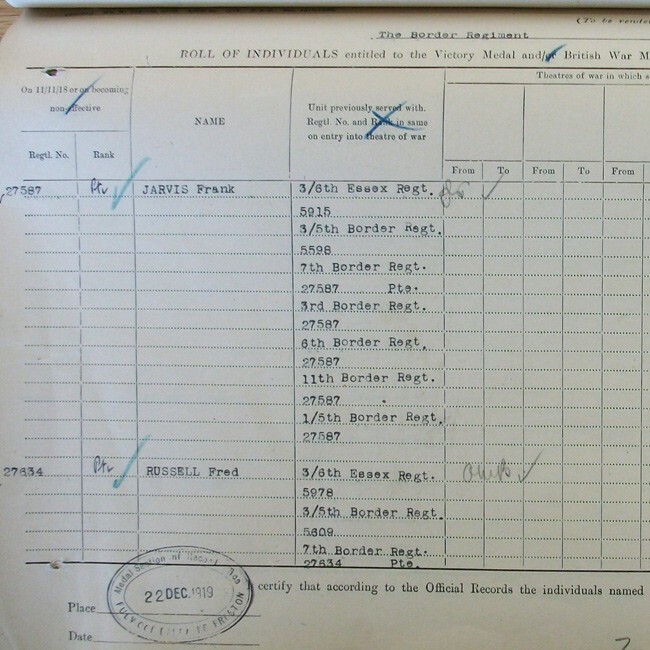 No doubt he did not want to return - but return he had to - at which point he found himself transferred to another Battalion and a very famous unit of the British Army. Together with other men from the Suffolk Regiment, he found himself in the 1st Battalion Royal Dublin Fusiliers, part of the 29th Division that had suffered during the initial stage of the Somme and required reinforcements for the planned campaigns of 1917. The Somme dragged on into November, with Haig wanting to make some final gains before the winter set in. He was convinced that the Germans were on the brink of exhaustion and that their reserves were depleted. His intelligence services appeared to tell him what he wanted to hear, for the stubborn resistance of the German army at the Schwaben Redoubt, did not support the intelligence that the Germans were caving in. The plan was to keep on attacking, though not on the previously massive scale. The results were the same depressing lack of gains and high casualty rates. The BEF’s manpower was draining away, as the winter rains added to the mud and misery for the poor infantry and the artillery, who just could not move the heavy guns and their ammunition across the water filled shell holes. 2nd During the night further efforts were made to locate ZENITH TRENCH. Great difficulty was experienced in getting its exact limits during the darkness. Very little information could be obtained except that it did not appear to be strongly held. Orders had already been issued to take ZENITH trench by surprise if it were at all possible. The attack started at 6 pm and was a complete success. About 8 pm the enemy counter attacked in small numbers but was easily repulsed. Battalion was relieved about 10 30 pm by 7th Lincolns. We shall never know whether the men ever received this message but it shows how at this late stage of the Battle of the Somme, any success was a cause for celebration and any effort to maintain the morale of the troops was to be used. Frank Jarvis the Essex boy in a Northern Regiment had survived his baptism and went on to fight in many more such attacks before a shell with his name on it hit its target in October 1918. Haig had been reluctant in agreeing to French demands for a major British involvement in 1916. Having planned and executed it, he saw some merits in the attritional nature of the long drawn out battle and at times had been rash enough to talk of breakthroughs. By November this optimism had gone and the realism was that the German Army had put up stout resistance to everything that Haig had thrown at it. The war was not going to end in 1916 on the Somme. Rumblings of discontent with Haig’s leadership were rife amongst London political circles and especially amongst Lloyd George and the anti Western Front brigade. However, again they had to accept the reality that within the army there were no other senior figures capable of taking over from Haig. Frank and Samuel Maltby in the 150th Brigade of the same Division were lucky to have been held in reserve and thereby to have avoided the disaster which fell upon the cities and villages of County Durham. On November 5th at zero hour, the troops rose from their trenches and went into mud up to their knees, weighed down by all the usual infantry equipment. Although some units took the Butte, they were driven back by German reinforcements so that by 6th November the Durham boys were back where they started. The sad difference being - that masses of them did not get back, but lay upon the battlefield a testimony to the futility of continuing the battle under such appalling conditions. Yet, Haig wanted to end it with a huge success and drove Gough into preparations for the final countdown November 13th - the Battle of the Ancre. None of my relatives was involved in this, mainly because it was given over to the 63rd (Royal Naval) Division whose Battalions had famous nautical names like Hawke, Hood, Howe and Drake. In the latter part of the attack, the 18th Division was involved but without the 53rd Brigade and Ernest Jarvis of the 8th Suffolks who were again lucky to stay safe in the Divisional reserve. At the end of it all, there was no real tactical advantage gained, and there were yet more casualties and very serious damage to the troops’ morale. The conditions were too dire for the BEF to gain any more tactical advantages. At last the High Command realized that the time had come for the Battle of the Somme to officially end on 18th November 1916. In November, at the Chantilly Conference, the plans for ending the war in 1917 had been set, under the direction of the French commander General Joffre. 1917 would bring a new list of French and Belgian place names Arras, Cambrai, Messines and Passchendaele to the attention of the British public and into the pages of military history. Put into blunt statistics, the Somme was a charnel house in which the youth of all participating nations was sacrificed for a few miles of ground. The British and their Empire suffered 419654 casualties, the French 204253 and the Germans between 450000 and 600000. However, tactically the battle of the Somme convinced the British and French commanders that the war could only be won on the Western Front if the German war machine could be destroyed. The modern day thesis is that Haig’s way was right, although in the case of the Somme, the actual location for the fight was not his but Joffre’s and had demonstrated that the French in 1916 were the senior partner in the alliance. The Somme was the place where modern warfare tactics were honed and developed for future applications - the artillery with its creeping barrage and counter battery techniques and the tank supporting the infantry, helping it to take the strong points. These would be the techniques by which the BEF would in 1918 win the war on the Western Front. However, these modern weapons were useless without the men, all of them, not just the infantry- although they were the ones who had to bear the brunt of this war of constant attrition. This has been the story of my relatives and their involvement in one of the greatest battles of all time. Miraculously, they all survived it, in most cases to fight another day and in some cases to make the ultimate sacrifice. 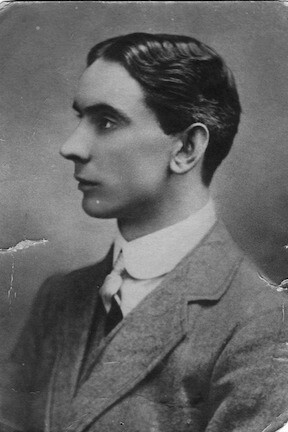 Ernest Jarvis went into 1917 to fight in the Battle of Arras and was killed. His body was never found and his name appears on the Arras Memorial to the Missing, as well as on his hometown - Chelmsford’s Cathedral Memorial. Albert Jarvis was wounded at Ovillers and when he had recovered was transferred to the Labour Corps working on farms in Norfolk until the end of the war. Wilfred Livermore was transferred to 112th MGC in the 37th Division and in 1917 fought in the Battle of Arras where he won the M. M. for carrying messages under fire. He made it to the rank of Sergeant at the age of 20 and died in captivity in May 1918. 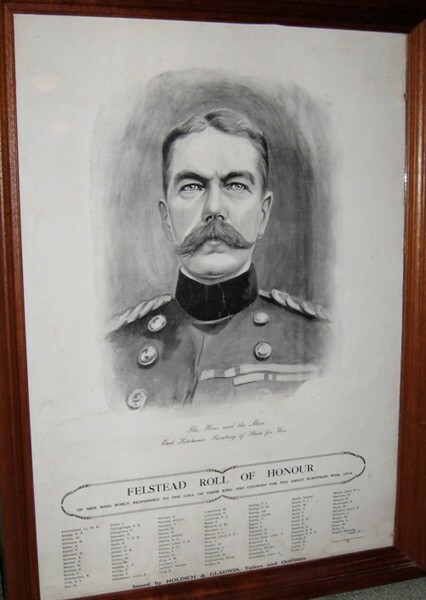 He is buried in Favreuil British Cemetery and his name appears on his home village war memorials in Felsted Essex as well as on the MGC Roll Of Honour in St Wulfram’s Church Grantham. Percy Livermore too went into 1917 being wounded at the Battle of Arras and later returning to France only to be shipped home with TB from which he died in 1920. Frank Maltby fought in the Battle of Arras and was killed by enemy shelling in July 1917. He is buried in Heninel Communal Cemetery Extension and commemorated on the war memorials in Cambridge and Ely Cathedral. Samuel R D Maltby was wounded at the Battle of Arras and returned in 1918 to fight in the three German offensives before being taken prisoner in May 1918. Frank Jarvis fought in the Battle of Arras where he too was wounded. He returned to France and was involved in the Advance to Victory before being killed by a shell in October 1918. He is buried in Bellicourt British Cemetery and commemorated on the Felsted Essex village war memorials and the Roll of Honour in Carlisle Cathedral. 18Th Division in the Great War - G H F Nichols, Naval & Military Press. Flers & Gueudecourt - Trevor Pidgeon, Battleground Europe, Pen & Sword Books. War Diaries of the units in which my relatives served on The Somme. Albert Jarvis [22 Yrs] - 9Th Essex 12Th Division. Wounded at Ovillers. Wilfred Livemore [18 Yrs] - 35Th Mgc 12Th Division. Ovillers, La Boiselle. Ernest Jarvis [26 Yrs] - 8Th Suffolk 18Th Division. Montauban, Delville Wood, Thiepval, Schwaben Redoubt. Frank Maltby [20 Yrs] - 5Th Yorkshire 50Th Division. Flers-Courcelette, Morval. Samuel R Maltby [22 Yrs] - 5Th Yorkshire 50Th Division Flers-Courcelette, Morval. 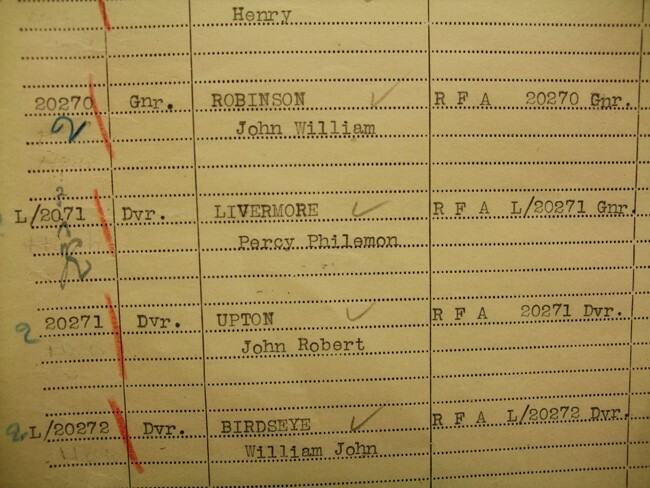 Percy Livermore [22 Yrs] - 162Nd Brigade Rfa 33Rd Division. Becordel-Becourt, Montauban.